With the death of Robert, this branch of the Sinton family tree comes to an end. Farmer. Owned a farm in the townland of Tamnavelton, Co. Armagh, Northern Ireland. Known as 'Forty Acre Bob' he never in fact owned 40 acres. His land, along with neighbours Bell and McClure totalled 40 acres. He bought the McClure farm when it became available. His daughter Roberta and her husband James bought the Bell farm when it became available. On his death, Roberta became the first, and only, person to own the complete 40 acres, part of which is now owned by her son Simon. 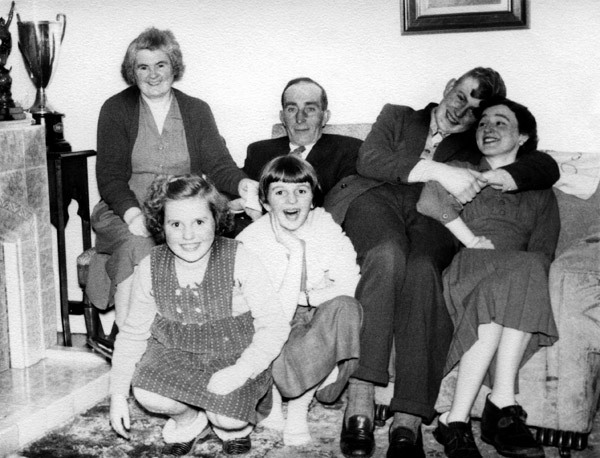 Alice and Robert Sinton in their house in Laurelvale, circa 1955. When the mouse cursor is moved near the face of a person, a small window will open to identify them. Married in the Methodist Church, Tandragee, Co. Armagh by Rev. R.H.Gallagher. Robert's address given as Tamnaghmore, Tandragee. Alice's address given as Tamnavelton, Tandragee. Witnesses Wallace K Sinton and his wife Evelyn.